Some homeowners will experience burst pipes, some will experience water heater troubles, and some will have trouble with their drains, but one plumbing issue that most homeowners will experience at least once is a leak. From small faucet leaks to major slab leaks, leaks are one of the most common plumbing problems homeowners have to deal with, and that said, we think it’s important for you to know a thing or two about them. Excess pressure. When too much pressure is applied to pipes, it can easily cause them to spring a leak. While yes, plumbing materials are designed to be able to withstand pressure, keep in mind that they really can only handle so much. Cracks. Although cracks aren’t experienced as commonly due to new advances in plumbing technology, they’re certainly still possible. For those pipes that do crack, the water has to go somewhere as it travels through, so it’s only natural that a bit would begin to seep out. Corrosion. Corroding pipes can absolutely lead to a leak as well, and corrosion can be caused by a number of factors – these factors include the chemicals in your water, the pH in your water, the temperature of your water, the water pressure and velocity, and the oxygen content of your water. The most common causes of pipe corrosion are almost always directly related to water quality. As a result, having your water treated is one of the best ways to prevent leaks from forming in your pipes. Read more about our water treatment services. 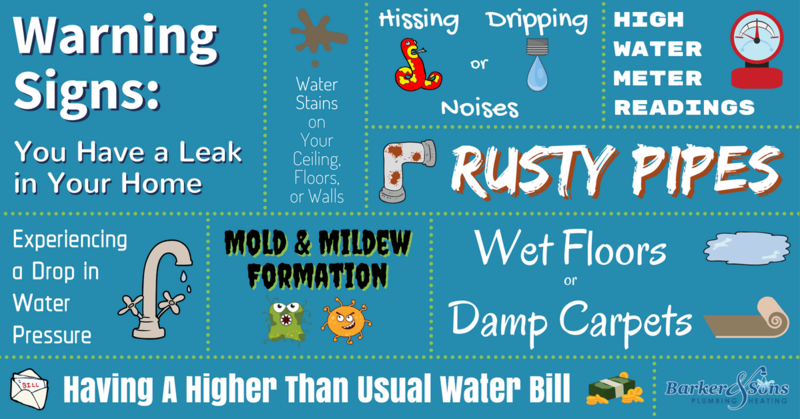 How Do You Know if You Have a Leak in Your Home? Although leaks can sometimes be tough for the eye to spot directly, if you’re on the lookout for the warning signs listed below, you’ve got a better chance at catching a leak in time to have it repaired before things get out of hand. In more obvious cases, you’ll want to look out for signs of water damage, mold, warped floors or walls. A warped or discolored wall or floorboard may indicate that water has pooled in this area and has already done damage, even if you don’t see moisture at the moment.These are all signs that a hidden plumbing pipe is leaking. A higher than usual water bill is an easy way to tell that something is going on within your walls. Unless you’ve had a sudden change in your water usage, your water bill should be relatively consistent. If your water utility bills are significantly and unexpectedly higher than past bills, it may indicate a leak. Also, compare your water bills with those of your neighbors. If there’s a significant difference, your home may be leaking. Although it isn’t unusual for small amounts of mildew to grow in places where water is constantly flowing (such as the corners of your shower), if it starts to build up quickly, and in strange places, that’s a surefire sign that you have a leak on your hands. One of the more obvious warning signs is noise. If you hear hissing or dripping sounds near fixtures such as your toilet or sink, there’s a good chance water is flowing somewhere that it shouldn’t be. Unless you’ve spilled something, your floor shouldn’t be wet — sort of a no-brainer, right? So, if you notice damp spots on your carpet or your floor seems to be discolored, something may be leaking beneath it. To determine leaks outdoors, start by taking a look at your garden hose. When turned on, there shouldn’t be any drips where it connects to the spigot, but if there are, you may need to replace the hose washer and ensure that the connection is more secure. During periods of colder temperatures, the EPA explains that a family of four generally shouldn’t use more than 12,000 gallons of water per month. Thus, if your water usage exceeds this (relative to the size of your family), there’s a good chance you have a leak. Check your water meter and record the level. Make sure no one uses any water for a few hours, then go back and check the meter again (it’s easiest to record the first level when everyone goes to bed, then check it again first thing in the morning). If the level has changed, you probably have a leak. Even a small toilet leak can lead to significant water waste over time. Remove your tank lid and place a few drops of food coloring in the back of the tank. Wait about thirty minutes and then come back to your toilet. Check the toilet bowl to see if any colored water has leaked from the tank into the bowl. If you see the color coming through, you have a leak. You should routinely check for water leak warning signs to prevent major damage to both your home and other valuable items. When one or more of these warning signs are visible, chances are you have or are in danger of developing a leak. Read more about The Benefits of an Annual Leak Detection Service Call. Where Should You Look for Plumbing Leaks in Your Home? Start by checking the space under your sink for any sign of moisture. But, if the leak isn’t coming from your sink pipes, you’ll need to move on to the shower. To locate the source of a leak near the tub or shower, start by splashing some water around the shower door to see if any spills out onto the floor. Additionally, you should also inspect the caulking around your fixtures to see if there are any cracks. If some are present, there is a good chance your leak is stemming from them. Similar to your bathroom, your first plan of action should be to check under the sink. If the bottom of the P trap is moist or you notice water stains on the bottom of your cabinets, you can bet that the leak is starting in your sink. Additionally, if you notice any changes in your floor, such as laminate becoming loose, you may be able to track the leak back to your sink too. Noticing a leak in your wall is pretty easy – those dark stains are hard to miss! In this scenario, though, it’s finding the source that can be tricky. As soon as you notice any sign of a drip, see if you can trace where it starts and ends. At this point, you should at least be able to determine where the leak is based. Then, an expert plumber like ourselves can come in and do the rest! What Are Some Ways to Prevent Plumbing Leaks in Your Home? A crowded cabinet could cause a leak. Many people use the cabinet under their sink to store cleaning supplies and other household items, but when this space is too stuffed and things are hitting into your pipes, a leak is more likely to form. Sometimes replacing is better than repairing. Take your faucet, for instance. If it gets to the point where it’s too corroded, it may be difficult for you to find the right parts if repairs are necessary. When this happens, installing a new faucet entirely (even if you really love your old one) may be the better option. You need to know where your main shutoff valve is. If you ever come across a leak in your home, you’ll need to know where the main shutoff valve is, since the first step to solving the problem is shutting it off. While you can’t turn off the water at your water meter in a severe emergency, knowing where your main shutoff valve is can be much simpler. What are the Dangers of Hidden Leaks? Not only do leaks get larger with age, but they can also potentially cause damage to your home. In addition to wasting water, a resource that we all rely on each and every day, household leaks can also cause major water damage – damage that could be costly to fix. Not to mention, water damage can also lead to health troubles for anyone in your home – here, we’re talking about mold. Since leaks can cause structural damage to your home and potential illness to those who live in it, it seems only obvious that you should have them repaired as soon as possible! Can Leaks Get Bigger if They’re Ignored? Yes. Just because a leak is small now doesn’t mean it won’t grow bigger over time. Water leaking out of your pipes or fixtures will eventually cause enough corrosion that even a pinhole-sized leak can grow and potentially cause damage to your home. Many people believe that small leaks will stay small even if ignored for a while, but the truth is that over time, they will get worse. That’s because the water from the leak will erode your pipes, which ultimately makes a small leak grow in size. Small leaks can quickly turn into thousands of dollars in repairs if you don’t repair them quickly. Do All Water Leaks Rise to the Surface? Unfortunately, not all leaks will rise to the surface, and in fact, many will stay hidden for quite a long time. Common sources of hidden leaks include rainstorm pipes, sewer lines, stream channels and deserted pipes. The easiest way to find these is by using sound amplification equipment. Knowing this, it becomes essential for you to work with a plumber regularly to detect any leaks you may be missing. On a national scale, households can waste up to 1 trillion gallons of water per year, which is enough to supply 11 million homes with running water all year long. On average, the typical household wastes more than 10,000 gallons of water each year on leaks. That’s enough water to wash 270 loads of laundry! Toilet flappers, dripping faucets, and leaky valves are the most common culprits when it comes to plumbing problems. Fortunately, they can all be taken care of with just a quick fix! Think your plumbing’s perfect? Consider this: 10% of homes have leaks that waste 90 gallons of water or more per day. Fixing your leaky plumbing can save you an average of 10% on your annual water bill. Why is My Sprinkler System Leaking? Regardless of when your home was built or what kind of materials it was built with, if a leak wants to form, it will form. Since leaks should be taken care of right away, it is in your best interest to have a reliable plumber’s number handy at all times. For those of you in Orange County, California, we at Barker and Sons Plumbing & Rooter are always ready to help with leaks or any other plumbing problem – request service online or give us a call at 714.630.8766. We’re available 24/7 to personally answer calls and we offer a 100% guarantee on all services performed.